The story gave me a Bleach Anime vibe. Especially, the giant chopping knife sword and the whole spirit thing. The grammar is understandable but needs some work. The art needs to be more consistent. There are pixelated ACE sprites sitting next to non-pixelated MV ones. 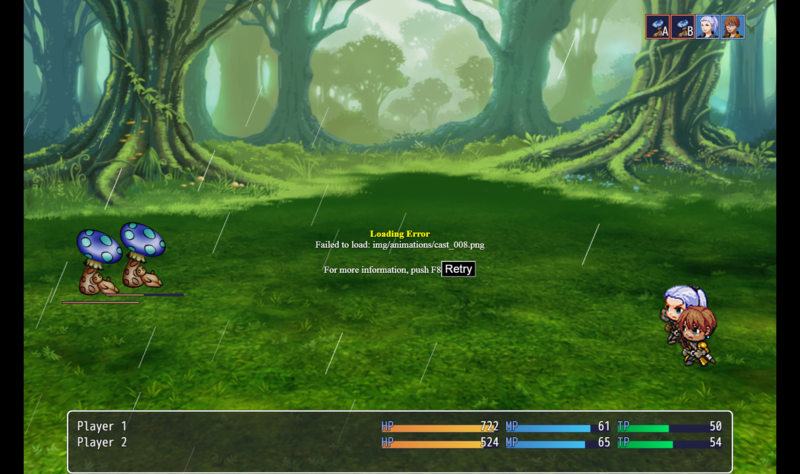 I personally hate quick-time combat, especially, in a game that uses a turn-based system. However, if need-be, I can usually plow my way through it. I made it to the crying lady and one-shot her with the special attack. I can see that a lot of work had gone into Mei, herself. She has quite a few custom animation and face sets. I love that NPCs react to the spirit and throw funny comments. A bit more polish and you might get yourself a game. Game-play is basically table ice hockey. The game would be easier if it didn't use mouse control at all. The theme of the game is "odd", but I like it. It has an over-the-top feel to it. The story is pretty interesting. Lots of visual novel elements, voice acting, custom menus and music. Once the custom art rolls in, your game would be golden. The battle is lackluster at the moment. The default smack and heal. I went after the elf girl. What the game needs is a dwarfs. Can't have elves without dwarfs! Edit: You should probably remove the default cancel choice. Very interesting concept. The game is brimming with features. Random weathers, lighting, etc. The story is basically two little girls get transported to another world and become men? I ended when I encountered a missing file bug. The game lacks polish but it's a good start. A simple platformer with custom art. This feels like a good start for a game that can be expanded upon. The falling damage got me every time. I don't know what is or isn't default, but I like it. The environment, battles, and story feels very Fire Emblem. After an hour, I made it all the way to the "go to the original room". Never found it. Cats are op when they aren't missing 50% of the time. Dang and the girl just cheer on the cats from the sidelines. The story is interesting. The art and music is amazing, however, the art culls a lot when using free grid movement. This is most apparent during battle. The mini-games were interesting but a little bit generic. The battle system. Why am I beating up "Blue Army guys" and not run them over going 60 mphs? Battle System Designer here: The Ai taking a long time to perform a turn is probably because the original Ai was designed to "think" once per turn. The new system causes the Ai to think three times making it three times as long to perform a turn. The reason for this is because after each action the Ai takes, it has to re-search the battleground, from the perspective of its new position to allies and enemy and its AP, and decides if it should end its turn. Thanks for the feedback, I'll look into possible future solution.